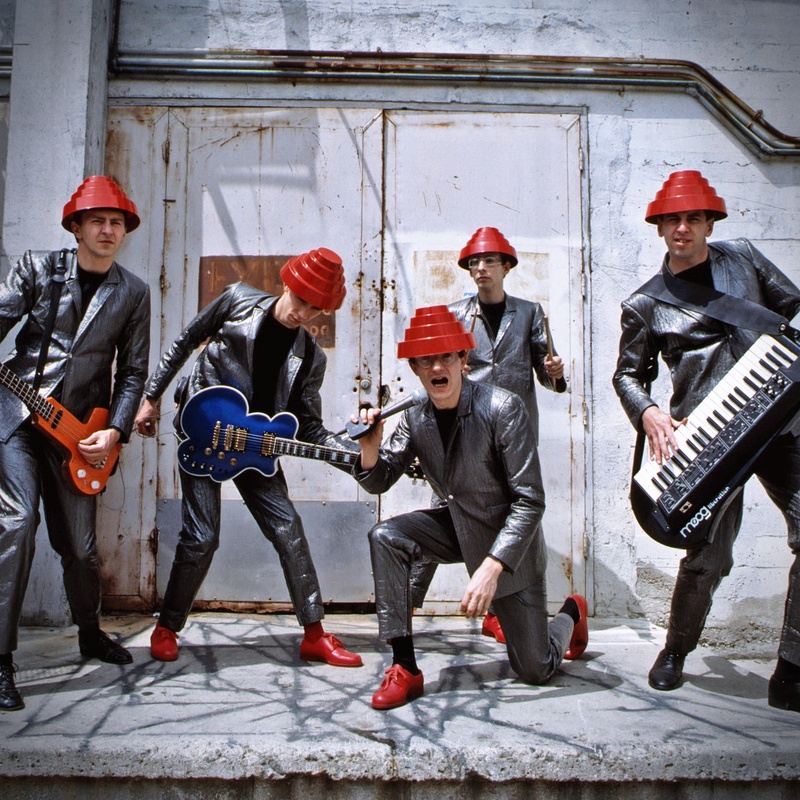 Devo have always taken an unconventional approach to their music, videos, and striking fashion sense so it’s no surprise that this attitude would also apply to their choice of guitars. While many think of them as a synthpop band with the occasional guitar thrown in, in their early years they were precisely the opposite – at times featuring three guitarists in their line up (guitarist Bob1 [Mothersbaugh], guitarist/keyboardist Bob2 [Casale], and singer/keyboardist/guitarist Mark Mothersbaugh). By the early 80s, however, Bob1 was the only member with strings on his instrument with Bob2 and bassist Jerry Casale having mostly switched over to playing their parts on synths. They seemed to have not only enjoyed unusual choices in guitars (shying away from the all too common Strats and Les Pauls) but rotating through many different models as well. Bob Casale’s main guitar seems to have been a red Hagstrom PB-24-G which he played at Devo’s first performance (as Sextet Devo) at Kent State University in 1973 as well as the “Satisfaction” and “Come Back Jonee” videos in 1978. Occasionally played by Mark Mothersbaugh as well as on Saturday Night Live in 1978 (with his trademark pedals duct taped to it). He can also be seen playing a Gibson Marauder at early shows in New York. During recent shows he has been playing a green Ibanez Talman TC420 with a red pickguard. Mark almost exclusively used Fender Telecasters which he liked to duct tape his pedals to. This choice was not only aesthetic but practical as well as he can often be seen twiddling the knobs on the pedals while playing. He played what seemed to be a stock Telecaster in the “Satisfaction” video with what appears to be an Electro-Harmonix Frequency Analyzer mounted on the body though it looks like at times he had up to three pedals. 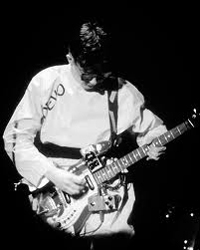 Live footage of Devo in Japan in 1979 also shows Mark playing what appears to be a different Telecaster modified with a humbucker in the neck position. During current live shows he plays a left-handed Fender Stratocaster with a pedal duct taped to it, of course. Left-handed bassist Jerry Casale has always played right-handed basses strung for a right-handed player (with the E string closest to the ground). At early live shows in Akron and New York he played a Gibson EB-3 before switching to a Gibson Ripper with the horns sawed off (and thick black arm padding added to the top side) supposedly to look more like a potato. This “Spudbass” can be seen in the “Satisfaction” video and on their Saturday Night Live appearance in 1978. He later had a plywood custom-made red rounded cross-shaped body fitted with two DiMarzio Model J’s and the neck from his EB-3 (as seen in Urgh! A Music War filmed in 1980). He then became an early adopter of the Steinberger L2 which he used since its release in 1981 (as seen in the videos for “That’s Good” and “Peek-A-Boo!” from 1982) and he continues to use in concert. 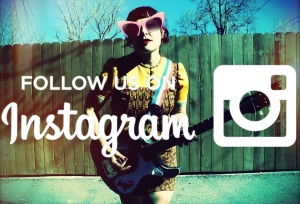 As Bob Mothersbaugh has recently said, “Twenty years ago, someone in the band decided that guitars were obsolete and nobody would be using guitars 20 years from then, and they tried to make that a reality, which really didn’t work for us.” It’s good to see the guitars back. 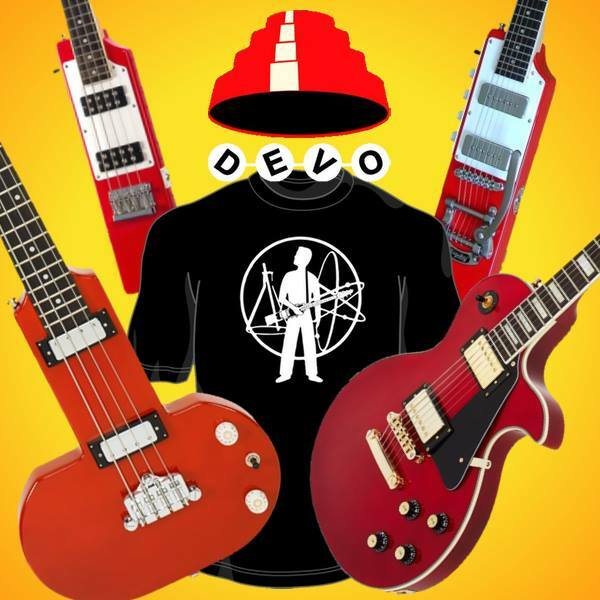 In case you were not aware, Eastwood Guitars have a full range of DEVO signature guitars and basses! 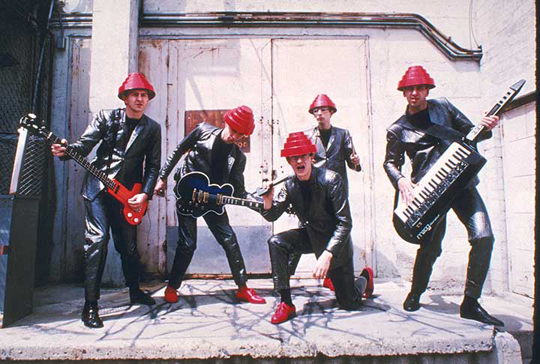 Didn’t Devo also play Tokai Talbo’s at some time ???? Mark’s left-handed Fender Stratocaster is actually a Squier. 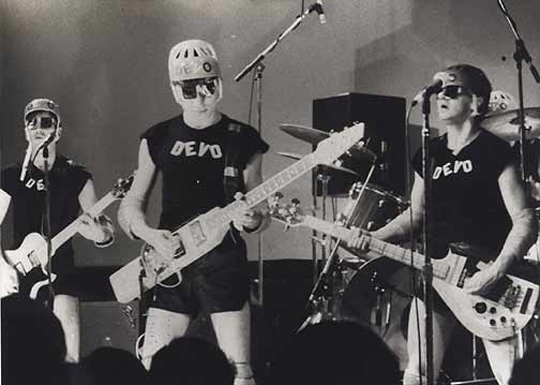 Devo’s the best concept band I can think of, all the guys were together on it. 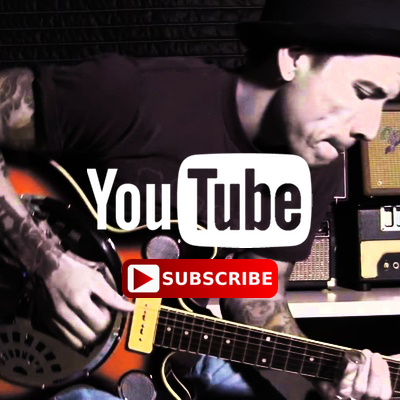 Check out “Uncontrollable Urge” if you’ve never heard it. Gerald only used an l2 for a year or so, them when the xl2’s came out he switched to those. That’s what he uses on the road now. The biggest giveaway is the screw holes are on the back of the body on the xl2’s, but they’re on the front of l2’s. PLEASE make a cloud guitar re-issue!!!!! I would give anything if Ibanez actually issued a Bob1 blue “Cloud Guitar”… That has been my dream guitar since I was 12 years old in the 80s. I saw them in concert in the 80’s. They were really loud and I could not hear for hours. They had some of the biggest speakers I’v ever seen in my life. It was a great concert.